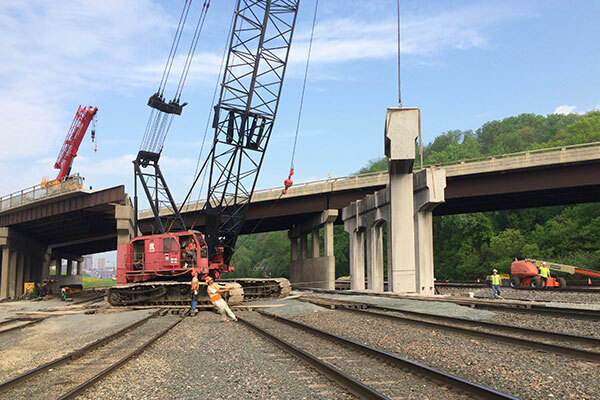 Kraemer removed the existing Warner Road Bridge and constructed a new 850-foot-long bridge over nine sets of live railroad tracks near St. Paul, MN. Located just south of downtown, the Warner Road Bridge sits on a flood plain between the Mississippi River and a 100-foot bluff. With and ADT of 17,900, Warner Road is a key trucking route and a direct link for residents of several suburban communities into and out of downtown St. Paul. Work included two additional pedestrian bridges that converged with the main bridge as part of the Samuel Morgan Regional Trail System. The existing bridge consisted of a 13-span plate girder steel bridge. The new main bridge is a 7-span precast girder bridge with the longest span 165 feet long.